As anyone who has ever had an aha moment knows, coming up with ideas is easy. Putting them into action — especially as a college student — is the hard part. That didn’t stop Rafael Ilishayev and Yakir Gola, who co-founded the on-demand convenience delivery service, goPuff, in 2013 as students at Drexel University in Philadelphia. Ilishayev was a junior at the time and Gola was a sophomore. GoPuff, as its name suggests, was originally created to provide college students with all the makings of a great night out: the company delivered hookah and smoking products in addition to food items such as ice cream and candy. After the company’s first year of business, Ilishayev and Gola made a conscious decision to move away from smoking products when it became clear that most of its sales came from snacks and household supplies, according to director of marketing Jake Levin. “I saw more opportunity in the convenience space than putting ourselves at a benchmark of smoking paraphernalia,” Levin, who joined the company in 2014, said. Though it still offers flavored hookah products and lighters on its website, smoking products typically account for only about 2 percent of goPuff’s sales, Ilishayev said. GoPuff operates through both an app and website every day between noon and 4:30 a.m., where users can purchase from an inventory of snacks and household supplies that ranges from Tic Tacs to condoms. GoPuff delivers the items to users’ home in 30 minutes or less for a flat delivery fee of $1.95. The company will also offer beer delivery once its alcohol license is approved. The service launched in Pittsburgh, its 15th city, Jan. 18, and will serve Oakland and surrounding neighborhoods like Squirrel Hill and North Side. At the Oakland location, goPuff employs five people, but has more than 100 employees across all its locations. 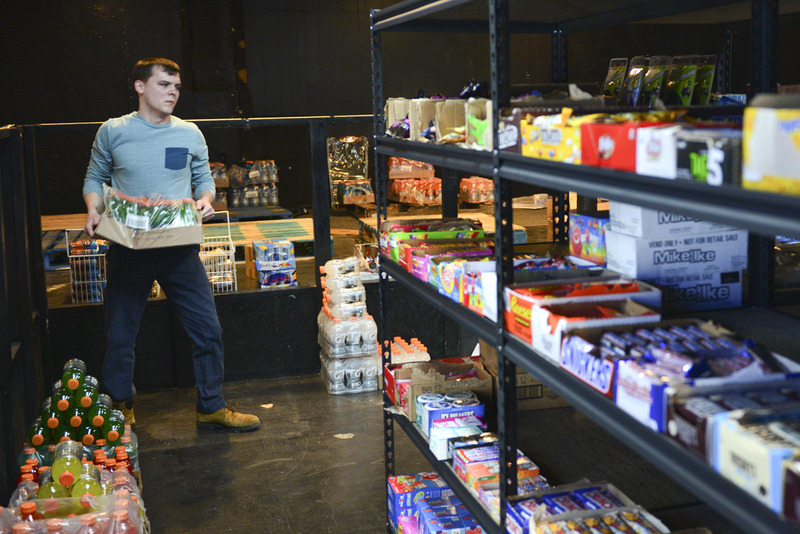 Unlike other delivery services like Postmates or Grubhub, all of goPuff’s inventory is stored in a central warehouse — in Pittsburgh’s case, the warehouse is on Bates Street in South Oakland. A day after its official launch Wednesday, goPuff was still moving into its warehouse. GoPuff’s space is separated into three large rooms: The first empty room will house its alcohol items, as Pennsylvania law mandates the alcohol is kept separately from their other inventory. The second and largest room will hold a handful of employees in bright blue shirts who will line shelves with boxes of cereal, toilet paper and detergent, among other commodities. The third room will be a lobby where drivers — who make deliveries using their personal vehicles — can spend time between orders. Each city’s goPuff location typically offers additional products specific to its region, and Levin is working to add Pittsburgh Popcorn to the company’s Oakland inventory. Like most good ideas, goPuff was created out of necessity. Gola and Ilishayev had the idea after Gola, the only one in his friend group with a car, became the de facto chauffeur for all of his friends when they needed groceries or random supplies for their house. “We realized [convenience store delivery] was something that many millennial college students need,” llishayev said over the phone from their headquarters in Philadelphia. As college students with no funding, they found the money to start goPuff by re-selling cubicles from bankrupt businesses until they’d earned about $75,000. “If you want it bad enough, you can figure it out,” Ilishayev said. Just a year later, goPuff expanded the service to Boston, and by 2015 it had reached Austin, Texas, and New York City. The company’s early success attracted such high-profile investors as Anthos Capital — a business management company — which made a $5 million investment to goPuff in 2016. Though their customer base is expanding, Ilishayev still thinks of goPuff as a service created by millennials and for millennials, who he said will feel inspired to start a business of their own when they realize two college students founded goPuff.